Little is known about Guadalupe fur seals because they were hunted almost to extinction before researchers began to study them. Being a member of the otariid (sea lion) family, they have external ear flaps and they have long front and hind flippers that allow them to walk when on land. They are similar to northern fur seals in appearance but are slightly smaller, and the males are lighter brown. Adult male Guadalupe fur seals also have a larger head and a long, pointed muzzle. Males reach six feet (1.8 m) and 300 pounds (136 kg), while females grow to four feet (1.2 m) and 100 pounds (43 kg). By looks alone, juvenile Guadalupe fur seals are very difficult to tell apart from juvenile California sea lions and northern fur seals. There is evidence that Guadalupe fur seals once bred as far North as Point Conception in central California. Due to hunting, they became extinct in California waters by 1825. Today, the only known breeding colony is on Guadalupe Island, off the Mexican coast. Increasing numbers have been seen on California's Channel Islands, and in recent years, several Guadalupe fur seals have stranded along the central California coast. It is not yet known whether these strandings are a result of El Niño events (warmer water pushing their prey northward) or a sign of Guadalupe fur seals returning to their former range. The breeding strategy of Guadalupe fur seals appears to be similar to that of northern fur seals and other types of sea lions. Males hold territories and breed with many females, and pups are born from mid-June to mid-July. Guadalupe fur seals tend to stay near shore and breed in caves on Guadalupe Island rather than on open beaches. There is evidence that they once bred on the rocky beaches of Guadalupe Island and some scientists speculate that hunting pressure pushed them back into caves for protection. Little is known about their behavior or their diet, but they seem to eat squid and lanternfish. Guadalupe fur seals are pelagic, living almost all of the time in the open ocean. Guadalupe fur seals were not identified as a distinct species until 1897. By that time, they were already thought to be extinct. Scientists did not know what a living Guadalupe fur seal looked like until 1928, when a few dozen fur seals were discovered on Guadalupe Island, two of which were brought to the San Diego Zoo. The breeding colony was not reestablished until 1954 and has been growing slowly since then. As a threatened species, the population is estimated to be at least 34,000. Guadalupe fur seals are now protected by law in the United States and in Mexico, and Guadalupe Island has been designated a pinniped (seal and sea lion) sanctuary. Hopefully, this protection will restore the Guadalupe fur seal to its former range and we will see them thrive again off the California coast. In its first 40 years, The Marine Mammal Center rescued 60 threatened Guadalupe fur seals. But over the course of 2015 and 2016, the Center rescued more Guadalupe fur seals than in the previous 40 years combined as these animals stranded in record numbers. The increased strandings have been driven by warming water temperatures that cause fish to move deeper and farther offshore, making it more difficult for young pups to get the nutrition needed, as well as an increase in domoic acid toxicosis in adult fur seals. Thanks to kind people like you, the Center has been able to rehabilitate many of these animals and give them a second chance at life. In addition, the Center’s research team has been able to study these animals in the wild by attaching satellite tags to released patients. These tags send information to the researchers that helps them better understand migration patterns and protect the wild population. Shop our online gift store and help The Marine Mammal Center care for our pinniped patients! 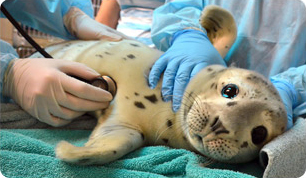 Adopt-a-Seal: LilaRach, a Guadalupe fur seal that was rescued by the Center at Stinson Beach. This soft and cuddly Fur Seal Plush Toy makes an adorable gift for children ages 3 and up. Threatened Species Adoptions and Totebag: 3 adoptions and an earth-friendly totebag.